The article encourages us to be a good influence in our communities by being well informed about current events and joining in community discussions and decision making. Liberty comes with the responsibility to be involved in our government and neighborhoods. All that is necessary for the triumph of evil is that good men do nothing. The First Presidency encourages members to get involved in civic and political activities. As we exercise free speech, remember that we are disciples of Christ. What we say and how we say it ought to be tempered by kindness and respect. As the ways of the world become increasingly distant from the Lord’s ideals, we will need to speak up on issues of common concern. We cannot be bystanders in shaping our public environment. 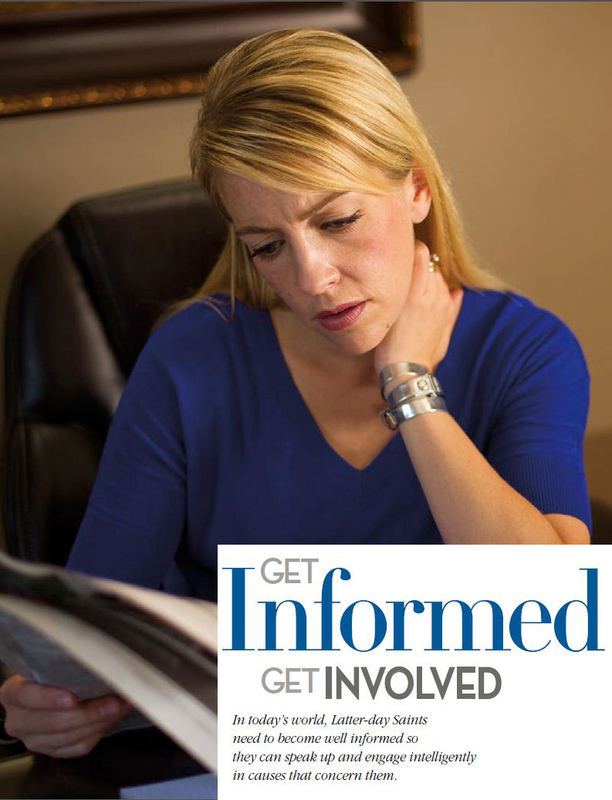 We have the duty and the right to get informed and get involved. Members are encouraged to support measures that strengthen the moral fabric of society, particularly those designed to maintain and strengthen the family as the fundamental unit of society. There are many resources available to help stay informed, including trusted publications such as the Deseret News National Edition, a weekly publication with news and analysis on topics related to faith and the family in contemporary society. A sample copy was included in mailings of the February issue of the Ensign. People in the USA and Canada can subscribe for just $30 a year, which also includes the Church News. This offer was not previously available to people in Utah without also subscribing to the Deseret News newspaper. Scriptures: Constitutional law should be befriended: D&C 98:5–6. The Lord caused the Constitution to be established: D&C 101:77, 80. Church’s declaration regarding governments and laws: D&C 134:1, 5-6. Articles: “The Divinely Inspired Constitution,” Dallin H. Oaks, Ensign, Feb. 1992. “A Caring Community: Goodness in Action,” Alexander B. Morrison, Ensign, Feb. 1999. “Religious Values in the Public Square,” Newsroom. “Church and State,” Encyclopedia of Mormonism. “Political and Civic Activity,” Handbook 2, 21.1.29. Citizenship in Gospel Topics on LDS.org. Becoming interested in secular and civic subjects was possible for me only through finding a connection with gospel ideals. The first point, “Following a variety of trustworthy, reputable, and responsible news sources” based on their motives, was instrumental for me. I knew that mainstream media sources offer partial truths at best, their motives being influenced by corporate sponsorship and other pressures, including government. But without having more thorough sources with which to compare their claims, I had no interest in doing so nor in seeking out such sources. What was pivotal for me was discovering independent journalism and open source intelligence news and commentary. Independent journalists, researchers, historians, and organizations fill in the blanks left by and expound orders of magnitude beyond mainstream media. Now, I have a greater understanding of the contexts of current issues and events and resources to consult on a variety of topics. As a result, I am more confident in studying out issues, forming my own opinions, and taking action beyond what I was willing before.